I'm excited to tell you about my Ozeri Ultra 42 in Wind Fan. It was really easy to assemble, I didn't even need any tools. When I opened the box there was the fan, the stand, and adjusting column (to determine the height), the remote, and manual and warranty card. I put it all together and was really impressed. This is a really nice looking fan as well as a very quiet fan. And it doesn't take up much room. 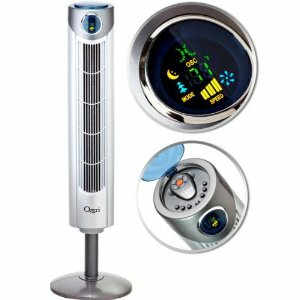 This fan has 3 pre-programmed settings to promote sleep, relaxation, and comfort as well as 3 speed settings. The remote has a great range and stores right in the top of the fan, so no lost remotes. This fan oscillates a full 90 degrees to really circulate air. I really like this fan, very attractive, quiet and makes my home more comfortable.